Snap the backbone just behind the head and pull the guts out with the head or take a small sharp knife to cut through the backbone, taking care not to cut all the way through and pull. Remove the backbone by running a finger along the spine of the fish, flattening it out into two fillets. Wash them with salt in a bowl with very cold water and ice. Change water as needed. This makes the meat firm. Separate the small anchovies from the bigger ones and save them for frying. When well washed fold them back together and place in layers in a glass or earthenware dish (never use metal). Cover with quality vinegar. The acid content should not be high or the flavor will be too strong and kill the flavor of the anchovies. If it is too strong add a little water. Refrigerate covered until they begin to change color becoming white, about 2 hours but if small one hour is enough. Watch carefully so as not to let them become too white. 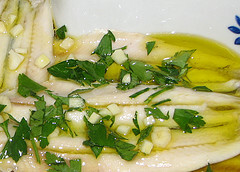 When ready drain off the vinegar and cover with olive oil. Sprinkle with parsley and garlic. Serve with bread (chips are good but not medieval) and wine or beer. They will keep 4-5 days in the refrigerator if completely covered with olive oil and if the no two legged cats steal them!